236 American boys lost their lives today in Vietnam, 950 Viet Cong killed. Pass the salad please Dad, and why are we at war? 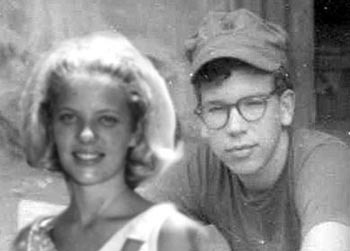 This photo composite shows the pacifist on her senior trip, and the soldier in Vietnam. Good evening ladies and gentlemen, this is Walter Cronkite,Dad, I got a role in the school play! 260 American boys lost their lives today in Vietnam, 1000 Viet Cong killed. I’ll need the car after school for play rehearsal, and Dad, why are we at war? There’s this guy playing Marc Anthony in the play Dad, I hate him, he’s an arrogant creep! 370 American boys lost their lives today in Vietnam, 1500 Viet Cong killed. No, Dad, I’m sure I’m not “sweet on him,” and by the way, why are we at war? Dad, that guy in the play, the one I can’t stand, you know the one that teases and torments me-he invited me to the cast party!!! 352 American boys lost their lives today in Vietnam, 1250 Viet Cong killed. Why’d he invite me? I’m sure he doesn’t even like me. And Dad, why are we at war? Dad, he took me in his arms and kissed me. 390 American boys lost their lives today in Vietnam, 1400 Viet Cong killed. His lips are so soft and gentle. Dad, where’s Southeast Asia? Dad, the most marvelous phone call- he invited me to the prom. 410 American boys lost their lives today in Vietnam, 1520 Viet Cong killed. Of course I’m not blushing and Dad, I’m getting sick of this stupid war! Oh, no, Dad, he enlisted today!!! 426 American boys lost their lives today in Vietnam, 1600 Viet Cong killed. Why did he enlist?! He could die there!? Doesn’t he know he could die there???? I HATE THIS BLOODY WAR!!! He’s stupid, stupid, stupid-dumb, dumb, dumb for enlisting Dad. 450 American boys lost their lives today in Vietnam, 2000 Viet Cong killed. How can you say he’s brave and honorable? I think I hate him more than this damn war!!! Yes, Dad, that was him at the door, he came to say goodbye! No, I didn’t invite him in Dad, he’s going off to war! My God, Dad, he’s really leaving-he said goodbye. I joined a sorority today Dad. President Johnson invoked the draft today for the first time in 25 years. They’re lying to us Dad, No More War!!! Hi Dad, no don’t worry, they’ve already doused the fire at our ROTC building! In a startling development today President Johnson announced he will not seek the nomination for reelection. They don’t want us in their country Dad, I hate this f-ing war!!! I just opened a letter from him Dad, he wrote that I was “his girl! !” I think it’s the war. I don’t know what I’ll write back Dad, I’m so afraid for him. I wrote him a “Dear John” letter Dad-I love him and hate him. Riots broke out today at the Democratic convention in Chicago. I know it was cowardly Dad, but he’s going to die! Oh, God, Dad, have you heard? They killed four students at Kent State! It is not known at this time why the National Guardsmen opened fire on the students. Dad, they just burned down our Gym….My God, we’re all at war!!! Today more protesting took the form of violence when the Bank of America building was burned to the ground in Santa Barbara, CA., as a protest against the war in Vietnam. How can war be right Dad, when everything about it seems so wrong? Good evening ladies and gentlemen, this is Walter Cronkite. I attended my first peace rally today Dad. President Nixon and Secretary of State Henry Kissinger announced plans for peace talks to take place in Paris. There was nothing else to do Dad, all my classes were cancelled because of the bomb threats! Hi Dad, I’m coming home early, our finals were canceled because of the riot. Secretary of State Henry Kissinger announced tonight that peace negotiations have broken down. Dad, they use Napalm over there!!! Dad, he’s alive, my God, he’s alive. Protestors continue to take over college campuses across the country. I wanted to go to him, to hold him and cry, but Dad, he didn’t even recognize me, he glared right through me. I shall never support war.